This week’s review is not exactly of a board game, because there is no board. It’s not of a card game, either. There are no cards. It’s not any type of game where you sit around the table to play, because for about half the time, you won’t be sitting. Some sort of party game, then. That fits with supporting up to 25 players, too. But it’s not like any party game I know, either. What The Last Banquet reminds me of the most is, funnily enough, the type of game we used to play back in kindergarten: everyone is standing behind their chairs, people move around in funny patterns, some people sit down and in the end there is a winner. It’s actually a lot like that, but with enough rules, different roles and strategy to make it interesting for adults to play. If they can get over feeling embarrassed about playing a kindergarten looking game in the park because, lets face it, none of us have a living room that gives 25 people space to move around. We played with 12 in here, and I’ll just call it extra challenging and leave the details to your imagination. The Last Banquet is not only the name of the game but also the name of the main scenario to play. In it, the King has invited all the important people in his realm – no peasants allowed, sorry – to a big, expensive banquet. He doesn’t have a clue yet that it may be his last, but the harsh reality is that almost everyone at the table wants to kill him. The only supports he may find, based on the number of players, are his Queen, the Princess and the First Knight. To the King’s fortune, however, his would-be-assassins present anything but a united front. Assembled around the table are two factions, identified openly and proudly by their paper insignia, and each wants to be the one to kill the King. Why exactly a murder by the other faction is not enough is not really explained, but I sense many personal grudges making their way to the surface here. 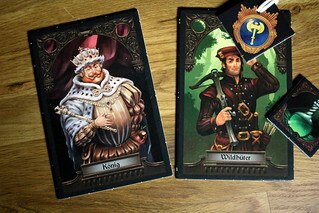 Next to their faction insignia, every player also receives a Role Card. For beginners, Role Cards are dealt out randomly, but with experienced players both factions can take turns picking roles and start building a strategy at this stage. The King and his own faction are exempt from this procedure, their roles are fixed. The Role Cards show a portrait of the Role and a short text you can use to introduce yourself to the other players in character. In general, The Last Banquet is way more fun when everyone plays their roles instead of merely going through the moves. The more important part of the Role Cards, however, are their abilities. Depending on the rules you choose to play, there are different options for each character. Playing with the sedate Dinner Rules, abilities mostly come down to two people trading places: either the player himself trades with someone or he instructs to other people to do so. Like the term Dinner Rules implies, these are intended to play over an actual dinner. Not much movement, not a lot of space required – not so many strategic options, either. The Full Rules give each character two options to choose from, and those can be much, much more wild. Trading places still is in there, of course, but there are more elaborate moves in there. The Witch, for example, may seduce a Gentlemen from the opposing faction who will not leave her side for the rest of this round. The two players will share a seat and only move together. Even worse, the Jester may call a bunch of people into the center and make them dance with their eyes closed. When he counts to three, they all run to a seat of their choice. Not very suitable for the dinner table, or anywhere with expensive china around. Finally, each Role also has a Favor action, another option to act that he has to ask the KIng for permission to use. The King may forbid it, but has to use one of his limited Veto Marker to do so. Once everyone knows their Role, the factions assemble to come up with a strategy and decide on a weapon carrier. Each faction only has one murder weapon – poison for one, a dagger for the other – and their goal is to place the person carrying the weapon next to the King at the end of the round. 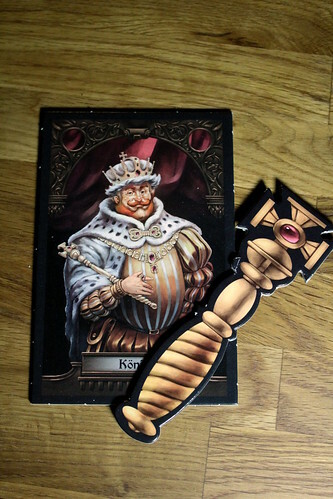 Play is then very simple: the King passes his Scepter around the table, in the direction of his choice. The player that receives the Scepter takes one of his actions, shuffling some people around, and then passes on the scepter. If the player himself changes position the scepter goes with him, so not all players will receive the Scepter in order. After taking his action, the player sits down. He can not take another action for this round, but he can still be moved by other players’ actions. When all players are sitting the round is over. If a weapon carrier is sitting next to the king now, he takes out his weapon and offs his majesty. If both weapon carriers are sitting on either side of the King, they start doing so and then act very embarrassed and pretend to be scratching their back with the dagger or seasoning their soup with the poison, and the King lives to see another round. If he’s still alive after three rounds, then the King and his faction win, otherwise the killer faction wins. If you want to keep playing, victory points are awarded to the victorious players and the factions are mixed up for the next round. The Last Banquet is the basic scenario and the easiest to play, but it’s not the only one. In Courier of the King one faction has to move their leader, the Baron, next to the courier carrying a secret message, but the Baron himself doesn’t know which courier is the real thing and which ones are the decoys. The other faction has to prevent the message from reaching the Baron in time. The Count’s Last Will has three equally strong factions fight over the counts inheritance. The most complex scenario, however, is The Accusation of the White Woman. Here, the ghost of the former queen starts out as her own faction with the goal to end up next to the new queen, her sister and murderer, to visit justice on her. The players on either side of the White Woman at the end of a round are converted to her side and her job gets easier with every passing round. No matter which scenario you play, The Last Banquet is a lot of fun with the right players in the right situation. First, you need a big group. There are special rules for as few as six players, but then every player has two Roles and that makes things awkward. I’d recommend 11 players or more, if you don’t have gatherings of that size, then The Last Banquet is not really worth it for you. Second, The Last Banquet is really not a game to play around the living room table. You just don’t have the space. Play it in the park, at a big picnic with friends. Play it at your kid’s scout group’s christmas party. Third, and that may be a problem for some, you need people that don’t get embarrassed about being seen playing a game that, from the outside, looks a lot like kindergarten. It’s probably not a game for your weekly gaming night, but if you regularly have big groups to play with and meet outdoors, then The Last Banquet is a lot of light-hearted fun. There is some strategy involved, but also a lot of chaos and people rushing around. That makes it an excellent game for older kids – the box says 10 and up, but I believe 8 and up will work with a bit of help – to play in mixed groups with adults. Like your annual family picnic. It’s also pretty good to play at wedding parties and other events where running in circles while tipsy is part of the program. It’s situational, sure, but when the situation comes up, what other game can you think of to entertain 25 people at once and be enjoyable?